Would you ever dare to step on the same tennis court as Serena Williams? Can you even imagine what it would be like? It happened to me last year and it conjured up a range of emotions from sheer terror to absolute glee. Just thinking back about it gives me the chills. You know all of her stats. Come on, I don’t even play tennis or know that much about the sport, but even I can tell you that Serena is the top-ranked player in the world. She’s 35 (just a year older than me) and she wins. Period. When she retires, I have no doubt she will be regarded as the greatest female player ever. And then one day, I played her. 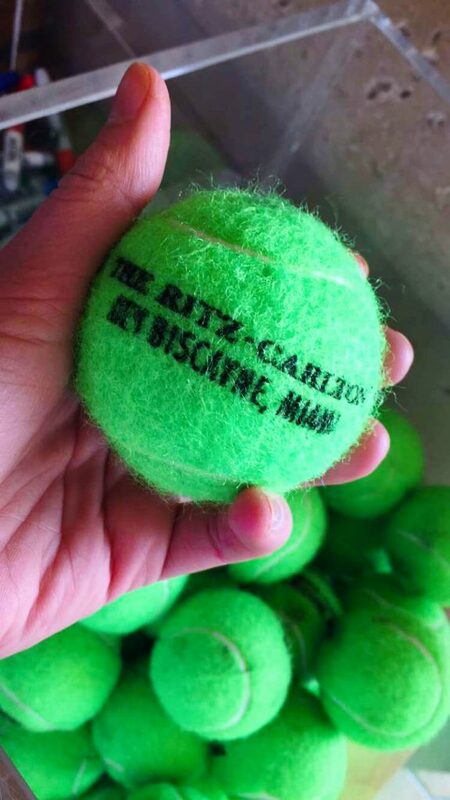 My friend, Tatiana Lora, texts me a few days before The Ritz-Carlton’s annual celebrity charity tennis event on Key Biscayne. Tatiana is going to kill me for writing about her in this blog post — she never seeks the limelight, but I have to give you a little context about our relationship. She has been running the PR show for The Ritz on the Key (and a few other properties) for quite some time now and we met way back when I was still practicing law. In other words, this girl has been with me since the beginning and I absolutely ADORE her. So if she says something, I listen. So anyway, I was planning on attending and watching the charity tennis tournament. It’s very entertaining to watch amateur players square off against the pros. Plus there are cocktails involved and it’s all to benefit a great cause: an organization called First Serve Miami. But Tatiana asked if I wanted to play. I don’t own a tennis racket. I don’t have a backhand. I don’t know the rules of the game. But you know what I do have? Balls. Because you’d HAVE to in order to not know ANYTHING about tennis and face off against the world’s GREATEST player. So yeah, I think I might have some Miami-style cahones. And in this moment, I’m not afraid to brag about it because it was crazy to say the least. First order of business: I get my squad straight. Because you can’t go into something like this alone. That’s why I was glad that both Susset Cabrera and Julie Wiesman were there to cheer me on. And then I run the super fabulous Diana Riser, my Publisher at Modern Luxury, who is as gorgeous as she is talented. I also see MIAMI Magazine’s super fabulous George Nelson. I was happy to see them, of course, BUT… I all of the sudden realize that it’s one thing to willingly embarrass myself publicly on the tennis court, but now the pressure is on. I can’t make Modern Luxury look bad! What if they kick me off of my EIC gig for the wedding magazine because of severe lack of sporting skills!? If I can’t play well, then I at least have to look cute. So we promptly go to the boutique inside the Ritz and make them pull out boxes that hadn’t even been opened yet from Fila. Yes, I can’t believe we did that. And Julie styled my complete head-to-toe outfit. Julie recommended drinking one glass of champagne to loosen inhibition. Not two glasses, just one. I took one glance at a group of older women (dare I say 50s or so?) decked out in serious tennis gear and smacking balls across the court like 50 shades of green. Turns out the “Philly Girls,” as they call themselves, make the trek down to warm weather for this tourney every year. And they practice 3 to 5 times PER WEEK. Oy vey. Another bubbly over here, please! As things are starting to heat up, I realize that I haven’t picked up a tennis racquet yet and maybe I should. And idunno, hit around or something? I sneak over to another court where I find some guys who look like they might know how to play. No one even acknowledges me. Awkward. “No really, I just don’t want to look like a complete idiot.” More stares. No one cares. The one person who came to my aid turned out to be Don Henderson, CEO of Cliff Drysdale Management. Thank God he felt sorry for me and taught me how to hold the racket and hit a few balls in about 10 minutes flat. 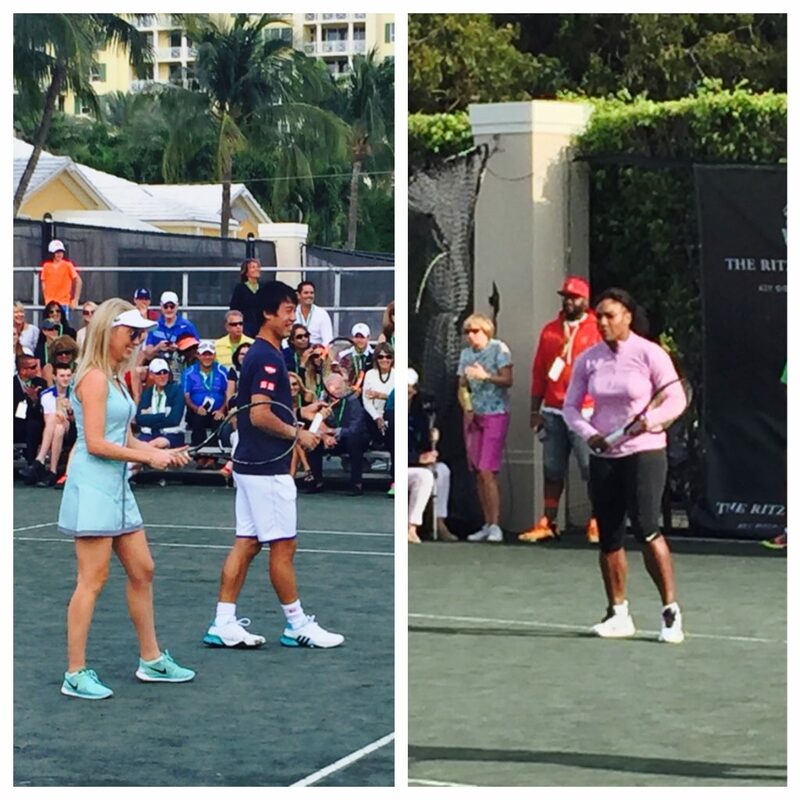 So when my big moment arrives, I take the court opposite of Serena and next to another name you might recognize: Kei Nishikori. Last year he was the only male Japanese tennis player ever to be ranked inside the top 10 in ATP singles ranking. So at least I have some fire power on my side. But I’m totally shaking in my bright blue tennis shoes at this point. From that moment, it’s all a blur. I’m pretty sure I whiff the first serve and strike a pose for good measure, which draws a few chuckles from the well-heeled crowd. But somehow I manage to hit the second one and that’s really all that matters because George caught it all on Snapchat! Yesssssss. But what’s the problem with Snapchat? It disappears after 24 hours and so does my proof that I actually hit the ball. But George sent it to me! And I have the evidence. 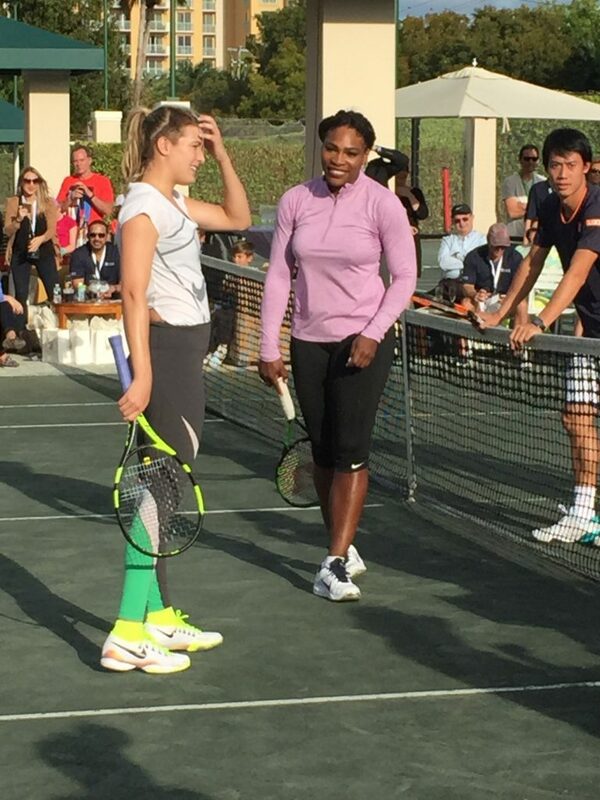 Kara Franker vs Serena Williams at The Ritz-Carlton All-Star Charity Tennis Tournament from Kara Franker on Vimeo. It was a magical moment and one that I’ll never forget. The Ritz hosts the celebrity charity event every year, so definitely put it on your calendar as a great way to get ready for the main event. Led by Grand Slam legend Cliff Drysdale, the all-star event includes cocktails, passed hors d’oeuvres, exhibition matches with the top stars, a pro Round Robin, a “King of the Court” challenge match pitting the pros against the amateur Round Robin winners and much more. Visit allstartennismiami.com to purchase tickets. All proceeds benefit non-profit organization, First Serve Miami. And don’t miss this year’s Miami Open, happening March 20 – April 2, 2017 at Crandon Park Tennis Center on Key Biscayne. For ticket information, call 305.442.3367 or visit miamiopen.com.